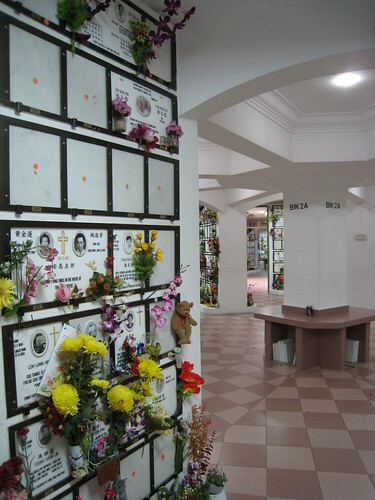 This is what we do every Good Friday with my mother's side of the family: in the evening, we meet wherever our forebears happen to be entombed --- formerly at Bidadari Cemetery, now at All Saints Memorial Chapel Columbarium --- and we make the rounds. Since I was a child, I've remembered seeing old black and white portrait photographs of my grandfather's parents and my grandmother's mother, imprinted onto their greying marble (or marble-ish) tombstones. These were the only images I held of them; they all died before I was born. Their markers today are smaller, made of more prosaic aluminium (or some other similar metal compound), each one fitting neatly into the perhaps 20 cm by 30 cm sconce it occupies. Instead of graves, they're in niches and we find them based on a very modern address indicating the block, floor and alcove. But the pictures are still there, albeit a little grainier than I recall. My grandfather oversaw the relocation of his family's remains to the columbarium way back in --- actually, I don't remember when exactly that happened, just that it must have been at some point in the late 1990s because my grandmother, who passed away in 1994, has always been at the columbarium and not the cemetery, and also because my memories of tramping around the cemetery pre-date my university years abroad. Tramping around the cemetery was, hands down, more fun than visiting the columbarium. Despite the untended graves (there was one that had collapsed inward near one of my great-grandmother's, I remember) and overgrown paths, it wasn't so much creepy as simply a bit messy. To get to the graves, we had to veer off the paved road at some point and track our way along uneven paths. No one wanted to accidentally step onto a grave --- although no one's really superstitious on that side of the family --- and no one wanted to go to dinner with dirty, muddy feet. Then there were the snails, plump on the path, with those fragile shells that we all stepped on at some point if we didn't watch where we were putting down our feet. It got to a point where we were making jokes about it among the cousins, to see which of us happened to kill a snail that year (but we did feel very sorry the instant we heard a crunch under our feet). For some reason, the cemetery was always fairly deserted when we made our Good Friday pilgrimage, which lent some charm to the occasion, as if it were some peculiar ritual that no one else had in their family. 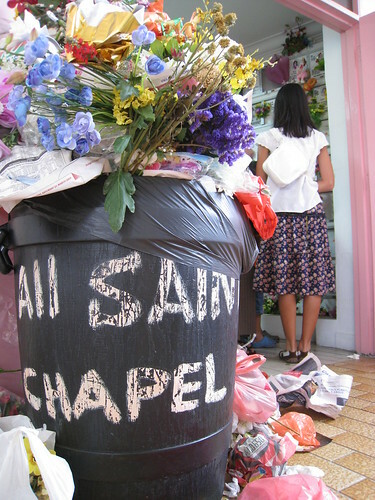 At All-Saints Chapel now, it's always crowded. Today we had to wait about ten minutes while a family finished praying around the niche of their deceased relative, which just happened to be in the same alcove as my family's relatives. And in every block, there were a couple of people lounging on the seats, exchanging news with their family or just waiting for the visit to be over. It's not easy to find a quiet moment, even if you wanted to. We don't pray or bow when we stand in front of the niche of a relative. Mostly we jabber about the details on the marker, which other deceased distant relatives or friends are located nearby, and whether anyone's put new flowers (usually fake ones, fresh ones would wilt quickly in our weather and make a mess for the caretakers). Most of my maternal relatives are in the same block. Today we spent some time hunting for another cousin's grandmother's niche, but even though we'd stumbled across it in previous years, we couldn't find it today. In the process, we came across other markers that made us pause and murmur. The long row of family members who died on the same day --- a car accident, perhaps? Two infant siblings, one born within a year of the previous one's death --- must've been just tragic for their parents. Two markers with no names, just an image of the deceased man, his dates of birth and death, a Christian verse and the name of the home where he must've been living before his death. I took pictures today because it dawned on me this morning that I don't have pictures of the old cemetery. The thing about rituals is you think they'll go on forever. But in Singapore, even cemeteries disappear (Bidadari Cemetery was acquired by the government to build a new train station and housing). Pictures are more important than ever. 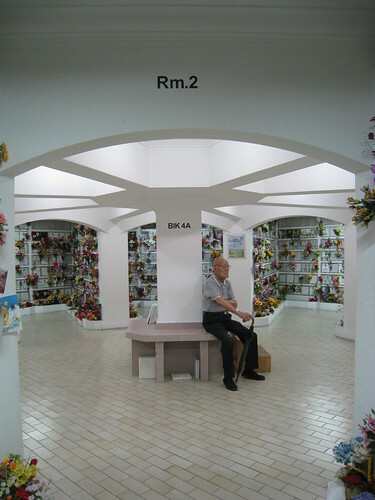 I really love Tan Pin Pin's "Moving House" that talks all about moving one's ancestors' remains from the cemetery to the columbarium. I've seen it so many times and it makes me sad (and almost a little angry) every time. Yeah, I like that film too. Made me wish I had the presence of mind to be present when they exhumed my relatives' remains, surreal as that would've been as well.